Elderly con-artists Jerry (David Kendrick) and Carl (Sonny Carl Davis) have worked their way across Texas, tricking multiple women out of their money. The two have begun working on their supposed final job when Jerry falls in love with the target, the waitress Maureen (Morgana Shaw). Unknown to the two, their previous target’s ex-boyfriend, Les (Frank Mosley), is a private investigator, hired to track down Jerry (who apparently does the wooing while Carl - whose existence is unknown to Les and his ex – sits on the sidelines) and her stolen money. The alcoholic Les slowly closes in on the two men as they work on the unsuspecting Maureen. “Shoot the Moon Right Between the Eyes” is an odd piece of cinema – a low budget country / folk musical western based on a short story by James Joyce (“Two Gallants”), featuring the music of John Prine, and starring mostly older actors. While first time writer / director Graham Carter has an intriguing concept for his feature debut, it’s one that never works. The cinematography, shot in the now almost entirely unused Academy ratio (think television screens before everything went to widescreen HDTV), looks cheap – a forgivable distraction given the film’s extremely low budget. Carter opens the film by listing four directors. Only one name – Edgar G. Ulmer – stuck in my brain due to being somewhat familiar with a few of his movies. Ulmer’s mention is suitable since he spent his career making mostly low budget affairs. Carter builds his cast with actors who have long resumes but aren’t instantly recognizable faces, bit time players getting a chance at bigger roles in a smaller production. Unfortunately, Carter isn’t able to get good performances from his cast. Davis and Kendrick’s performances often come across as forced, with Davis becoming particularly goofy in some of his scenes. Frank Mosley doesn’t even win you over with his portrayal of the bumbling P.I., who fortuitously manages to stumble his way across the con-artists trail. Shaw and Kendrick romantic relationship, arguably the central focus of the movie, doesn’t have any spark. Earlier in the movie, before Jerry starts courting her, Maureen catches Jerry and Carl spying on her, the inept pair barely hiding behind a truck parked outside her house. She already suspected these guys were up to no good, why does she still agree for a date? It’s a relationship you know won’t end well and, in all honesty, don’t in the least bit care about. This all leads to the film’s cringe-worthy musical numbers. None of the cast members can carry a tune, yowling their way through the arrangements of Prine’s music. While most of the numbers feature the performers just standing there, one lamely makes a failed attempt at more interesting choreography. As bad as the musical sequences are, a couple scenes do show some promise for Carter. In these scenes, Carter opts to film the actor or actress standing in a darkened space, lit so that their face and front side are easily visible but leaving the background dark while also stylishly lighting them from behind, creating a sparkling outline against the inky blackness. These are brief moments of appeal in a feature that slogs through its run time. Besides the aforementioned positives, nothing in “Shoot the Moon Right Between the Eyes” cohesively comes together. Running only a scant 75 minutes (according to the festival schedule), it’s a movie that is more of a punishing chore to sit through than anything. 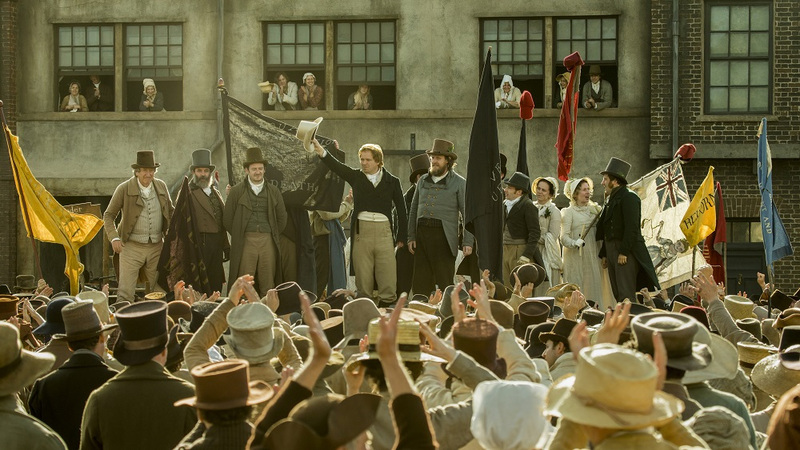 Mike Leigh's new feature tackles the tragedy in 1819 when a crowd of some 60,000 people from Manchester and surrounding towns gathered in St Peter’s Fields to demand Parliamentary reform and an extension of voting rights. 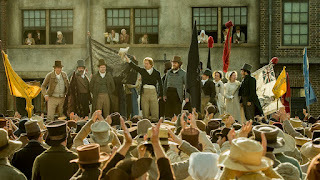 The release of the film marks the 200th anniversary of what has become known as the Peterloo Massacre. The peaceful gathering to listen to an activist speaker turned deadly when the militia charged the crowd in an attempt to arrest the organizers. The story begins with a young soldier, Joseph, who has returned from the Battle of Waterloo suffering from PTSD and still wearing his uniform. He comes from a poor family in Manchester. His parents Joshua and Nellie. Joshua, son Robert, daughter Mary, and daughter-in-law Esther live together and toil in the local cotton mill seven days of the week. In the depressed economy the traumatized Joseph cannot find work. The men attend meetings where local agitators discuss radical campaigns for equal civil and political rights. The magistrates sends spies to these meeting to gather evidence to arrest the leaders and speakers. Obviously everyone having equal rights will put a crimp in the status quo. Some of the magistrates are of the notion that there should be a separation of have's and have not's. It's a very wordy script and with the heavy accents it's sometimes difficult to understand some of the dialogue. The story doesn't focus on a major protagonist but gives insight on divergent groups. From Joseph's family on how his mother bakes hand pies and sells them for a penny each at the local market, to magistrates giving outrageous prison sentences to the poor for small infractions. There are the local merchants discussing the needed reforms, they gather at the local newspaper that is printing and supporting the reforms. There are scenes with the dandy Prince Regent who is more concerned with his personal comforts than the concerns of his subjects. He's easily manipulated to see the coming gathering to hear the famous radical Henry 'Orator' Hunt speak. There is also some conflict with some of the organizers who are put off with Hunt's demand that he would be the only one to speak. Attendants are encouraged not to bring any weapons less the powers that be see it as a hostile intent. Ultimately it doesn't matter to those pulling the strings. The film is clocks at 2 hours and 34 mins. The small details of their lives, the costumes, the set decorations, is very immersive. It maybe more difficult to follow the characters, but the issues of what these people are experiencing are very universal and can be related to what we are going through today. The incident was christened Peterloo by the reporters covering the event. Shocked and shaken, 15 people were killed and 700 wounded when the mounted cavalry charged the crowd wielding sabers. The massacre played a significant role in the passage through Parliament of the Great Reform Act 13 years later. In the near future-ish, the world is under an extreme drought. Water is a precious commodity. The landscape is dry, most businesses and buildings have long been abandoned. It's as if everyone has hunkered down somewhere unseen. We meet Ruth (Gugu Mbatha-Raw) who may be running away from something. She seems to have a strange ability to cause earthquakes. A man speaks to her in a cafe. He says he knows what she can do and wants to help. He's a scientist and had been looking for her for a long time. So begins this quiet, intriguing woman-centric, part sci-fi, part family drama directed by Julia Hart who wrote the script with Jordan Horowitz. It's a tight quiet film that doesn't waste time on explaining everything and lets the viewer immerse them selves into the lives of Ruth, her mother Bo (Lorraine Toussaint) and Ruth's daughter Lila (Saniyya Sidney). Ruth's power was different from her mother so she ran away. Got into drugs and alcohol finding herself pregnant. Knowing that her "episodes" was not safe she left Lila in her mother's care. They live in an isolated farmhouse. Nina Simone's "New World Coming" is playing on a turntable while Bo is smoking a cigarette on the porch. Suddenly she manipulates the smoke in a colorful array before it falls to the ground. This is the first inkling that maybe Ruth's seizures are not singular. Her daughter Lila is a gifted mechanic, is able to make her cup disintegrate and come back together. The colorful effects she is able to experience afterwards is what makes her smile, blissful in the beauty that only she can see. Ruth was never able to see those colors. Nor could she use her powers like her mother and her daughter. While Ruth is trying to resolve her relationship with her family, the guy from the cafe Bill (Christopher Denham) tries to get the government agents to not take Ruth by force. After all they don't understand what she can do to them. The police chief Ellis (David Strathairn) who has a personal connection to the women warns Bo that they are on to them. The male characters in this are very secondary to the female leads. They use their force and single minded authority to threaten and bully. The issues of climate, female empowerment, and creativity are all woven in to the story. Ruth discovers a book that was written by several generations of women of their family. All having the same kind of powers. Ruth realizes that she is gifted by something that is extraordinary. This may seem slow at first, but you really feel for the characters involved. As Bo tells Ruth, "This is only the beginning". The ending really begs for a continuation of what they can accomplish in the future. I wasn’t into documentary films based on educational discoveries, histories, or one’s own experiences on encountering any events or situations, but needless to say, this documentary really hits high on this year's Dallas International Film Festival as well for other film festivals around the country. Director John Chester really put much commitment on helming and explaining each events that takes the audience to the wonders of farming. I mean, to those who don’t know, it’s a documentary about two city dreamers and a dog unleashes a farming dream to own a many acres of land and operate a farm there with trees, animals, and soil. Here in “The Biggest Little Farm,” John Chester and Molly Chester, along with their dog named Todd, develop an inspiration that chronicles the 8-year story of Apricot Lane Farms as a farmers and caretakers for the farm animals and fruit trees. Throughout their history with farming, the farmers are able to clean and plant thousands of trees using manure and gather many animals to the farm by seeking assistance from the public as support. However, as the farming continues, they made it through several horrible twists of events including drought, coyotes, and others. As a result of these events, they come to realize that they must survive to reach greater heights for the sakes of their farm and animals and to understand the wisdom of nature, and of life itself. The film itself gives a warm, fuzzy feelings based on their personal experiences on farming where dreams can come true. 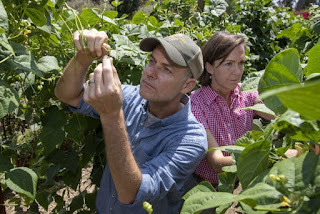 John Chester and Molly Chester made a choice on owning a hundreds of acres that will lead to the audience to know about the environment, the need of bees for fruit and honey, and the dangers of these farm animals. The farm also serves as a friendly, educational location to study nature, microorganisms, biology on animals and plants, and long periods of drought. Though, the hardest things to watch are the animals’ endangerment from carnivores, wild drifting weathers, and small bugs that ate fruit from the planted trees. These can become quite a predicament when it comes to farming as well as taking care of them along with their babies and chicks as families and mammals become the center of the film’s dynamics. There isn’t much from the entire plot here, “The Biggest Little Farm” is really light, fun-filled adventure to explore the valleys of nature and humankind all around. With a sharp eye with a careful glance of the setting and the characters, the plot and the story really fit well and falls to the category for both audiences and environmentalists. Even the dog serves as an advice and inspiration to both farmers. “The Biggest Little Farm” is a great film, but there’s nothing more to add to increase attention and see what the outside of the farm’s circle is. I loved it, but I can’t give a higher grade for this. 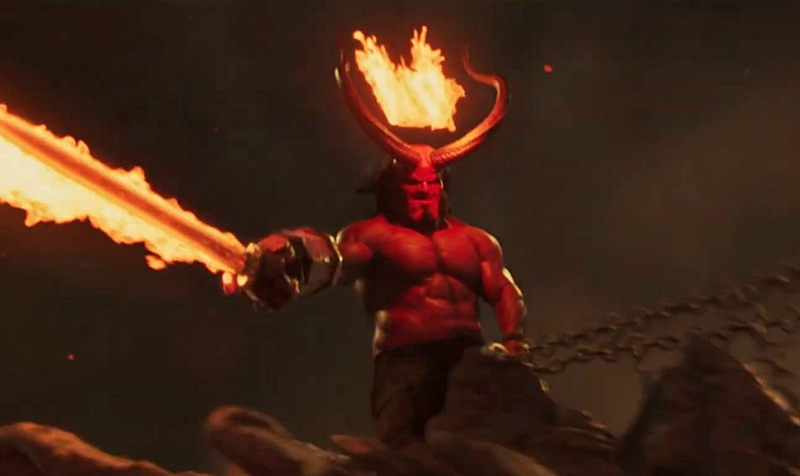 Neil Marshall’s rendition of “Hellboy,” takes full advantage of the MPAA’s R-rating in that he relishes the violence factor throughout the running time. This one does not have Ron Perlman, rather David Harbour of Netflix’s Emmy-winning “Stranger Things” as the title character, who lives in a place all his own. Ian McShane of TV’s awesome “Deadwood” as well as “John Wick” is Hellboy’s father, professor Boom. He essentially oversees the Bureau for Paranormal Research Defense of which Hellboy is involved with in some capacity. Like the very inventive “Men in Black” franchise they are just a fictional part of the federal government. Milla Jovovich of countless “Resident Evil” entries is the villain of the tale, an evil sorceress known as Nimue, aka The Blood Queen. Early on in the movie, she is dismembered and cut into various pieces and spread across the land during the reign of King Arthur. Also involved in the storytelling tale are various ghouls, ugly entities and disfigured witches galore. One scene also involves a witch eating parts of a child in a stew. Her identity is that of a creepy disfigured peg-legged old woman who just lives for the moment. Marshall has done some great films, notably his sophomore effort, 2005’s “The Descent.” Although that was a horror entry, it had some dynamic storytelling techniques involving a group of friends encountering some netherworld blind zombies. He also was Emmy nominated for a couple of episodes of HBO’s “Game of Thrones” in 2012 and 2014. Besides Marshall, another writer comes into the fold with Mike Mingola, who created Hellboy many years ago in a Dark Horse comic book of the same name. His writing captures the inventive fantasy dynamics that encapsulate the planet this new incarnation of Hellboy and the world it currently inhabits. The rest of the cast, including Daniel Dae Kim (“TV’s “Hawaii-Five-O,”) Penelope Mitchell, Sophie Okonedo (Oscar nominee for “Hotel Rwanda”(2005) and Sasha Lane (“Hearts Beat Loud”). All fit the bill and are suited for the complete storyline. I had such a good time watching these denizens fully embrace all of the characters and their identities. I just smiled all the way until the last frame of celluloid ended this engaging story. When it comes down to it, “Hellboy” does what it’s supposed to do and just entertain the audience for a solid 2 hour spell. The $50 million budget shows up on the big screen, since one witnesses giants storming down the river Thames. 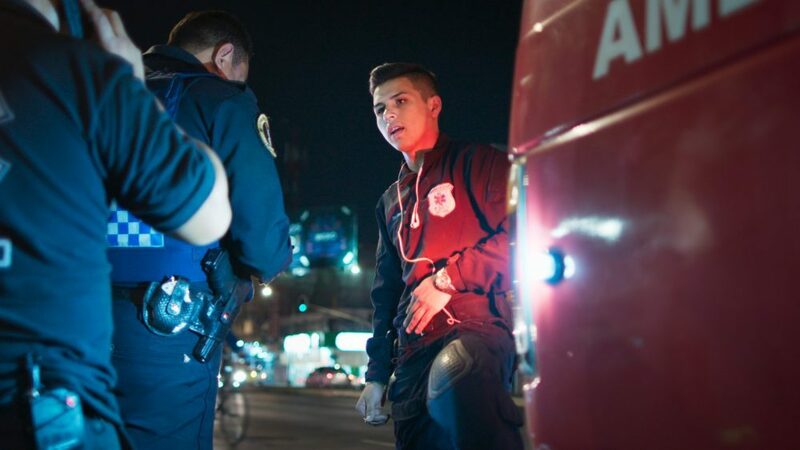 In Mexico City, a metropolis of nine million people is only served by 45 functioning government ambulance. This is the startling fact that begins Midnight Family, and indeed, the text continues to startle. In the wake of such an institutional or economic failure to serve the people, privately operated ambulance services spring up out of nowhere. Luke Lorentzen’s film follows the activities of one family that operates such a service, but while the calls they respond to are the central purpose of the film (providing what can only be described as “set pieces,” given the way the director captures the action), this is a movie that is more valuable for the things it has to say about this family. A curious thing to notice from the beginning is the feeling of seeing staged moments within and involving this family. Some of this cannot be faked, such as the exhaustion felt by Fernando, the current patriarch of the Ochoa family, who takes medicine for and constantly checks his heart rate. This job is a source of enormous stress for the man, who must worry equally about the success of his business and the well-being of his family. The survival rate of his patients is certainly a concern, but of equal or greater concern for Fernando is the ability to pay for the equipment that is the vessel for that medical care. The operation seems to have been manhandled by Fernando’s son Juan, a 16-year-old paramedic, wise beyond his years but also a bit conniving. As an example of this, take his treatment of an 18-year-old patient who has been viciously headbutted by a boyfriend: As willing as he is to call her mother, he also keeps in mind the necessity to send them to a private hospital. We do not come to understand the depths of this decision until the late in the film, when the full portrait of the capitalistic model of this ambulance is painted. It comes into full view with a remarkable sense of honesty and compassion. It also reveals a darker heart to these subjects. Josué, the youngest child, is an exception, but nearly everyone else here seems to be playing to the room. Conversations, both on the phone and between people face-to-face, have an oddly staged feeling. The feeling is a wrong one: These are genuine people, but they also are trying to represent their business to a cameraman. The calls are genuinely terrifying, particularly the way Lorentzen (who was cinematographer and editor) sets the camera on the dashboard of the ambulance, amplifying the tension. 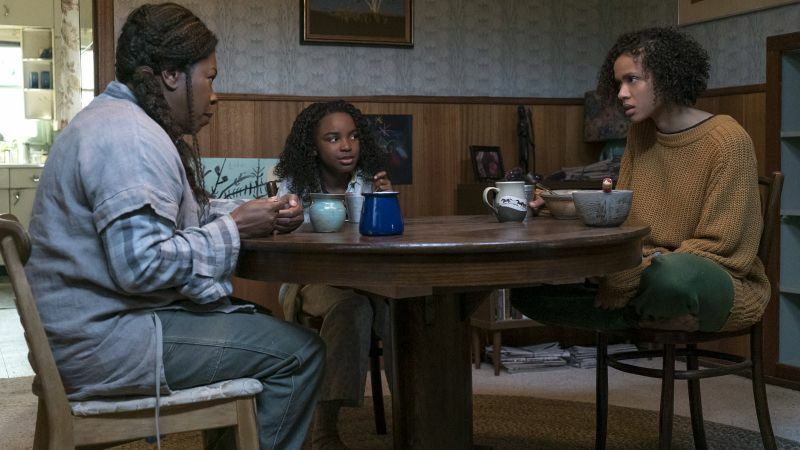 The filmmaker could have gone a bit deeper into this aspect of the film, particularly its toll on this family (It also immediately lends itself to being serialized in television form). But Midnight Family is a curious and quite effective examination of economic straits.